Asparagus, or garden asparagus, folk name sparrow grass, scientific name Asparagus officinalis, is a spring vegetable, a flowering perennial plant species in the genus Asparagus. It's low in calories and a great source of nutrients, including fiber, folate and vitamins A, C and K. Additionally, eating asparagus has a number of potential health benefits, including weight loss, improved digestion, healthy pregnancy outcomes and lower blood pressure. 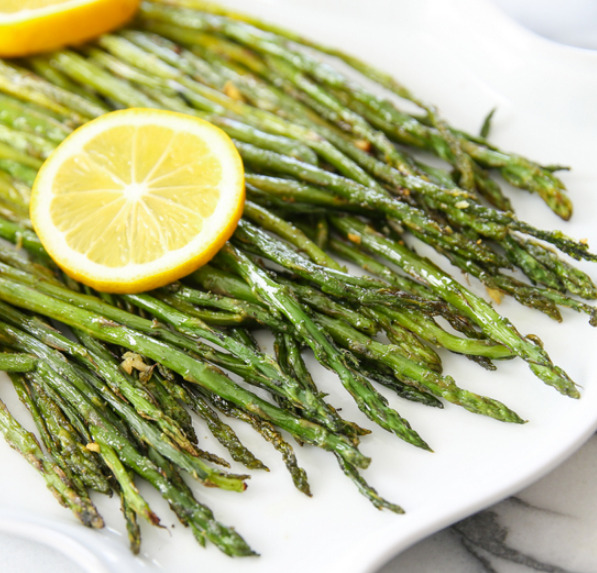 This simple roasted asparagus dish is a delicious way to enjoy asparagus and makes an easy side dish. Preheat oven to 400°F. Line two baking sheets with parchment paper. Trim bottom of asparagus. Lay a single layer of asparagus on each sheet. Sign up with your email address to receive farm news and updates.